120 Q. Why did Christ command us to call God, “Our Father”? what we ask in faith. 121 Q. Why the words, “Who art in heaven”? His pardoning grace and saving love proclaim. Boundless and endless as the heavens above. Bless Him, ye angels, wondrous in might! Bless Him, His servants, that in His will delight! what we ask in faith.” Another awe-inspiring image in Scripture, particularly in Psalm 121, is that of God as “the Keeper of Israel.” He is the one who keeps our very lives (v. 7), and we cannot doubt that he will provide whatever else we need for body and soul—especially when we request it in faith. For shelter by day and by night. Look thou to the hills for repose. “These words teach us not to think of God’s heavenly majesty as something earthly.” Even though God is our Father through Christ, he still “dwells in unapproachable light” (II Tim. 6:16). Psalm 93 reminds us how holy our God is, and how holy his servants must be. Of course, Jesus Christ was the ultimate Suffering Servant, the one who satisfied this demand of perfection and opened up the way for us to have access to the Father. And girded round with might. Who in Thy temple dwell. These words also teach us “to expect everything for body and soul from his almighty power.” The shortest song in the Psalter also packs the most powerful punch, exhorting all the nations to praise God for his unchanging faithfulness. The teaching of the Lord’s Prayer leaves us with no excuse not to do the same! O sing praises to His Name. Greetings, readers. It’s been more than a month since my last post, and much has been transpiring in my second semester here at Geneva College. I’m continuing on as a communications major and preparing to add a music minor; I’ve picked up an apparently permanent job as “staff accompanist” for several of Geneva’s voice majors; and just two weeks ago I was touring Ohio with the college choir, The Genevans, singing a concert of a cappella psalms in various churches. For a psalm-singing nerd, that’s pretty close to heaven (and I hope to share more about it at some point). Today, however, I just participated in a very unique experience from a rather different part of the church music spectrum: Sacred Harp singing. This old American tradition is often called “shape-note singing” because its hymnals assign their noteheads four different shapes to aid non-musical singers in picking up the complex four-part harmonies. The first verse of every song is sung in a simplified form of solfeggio with the syllables “fa,” “so,” “la,” and “mi.” After that the words are sung—always with a strong rhythm and as much gusto as possible. On one hand, the thought of self-declared nonbelievers singing these psalms and hymns is a little jarring. It’s unsettling because it forces me to ask: Do I really believe everything I’m singing? Am I still being nourished by the content of worship, or have I become hopelessly preoccupied with its form? 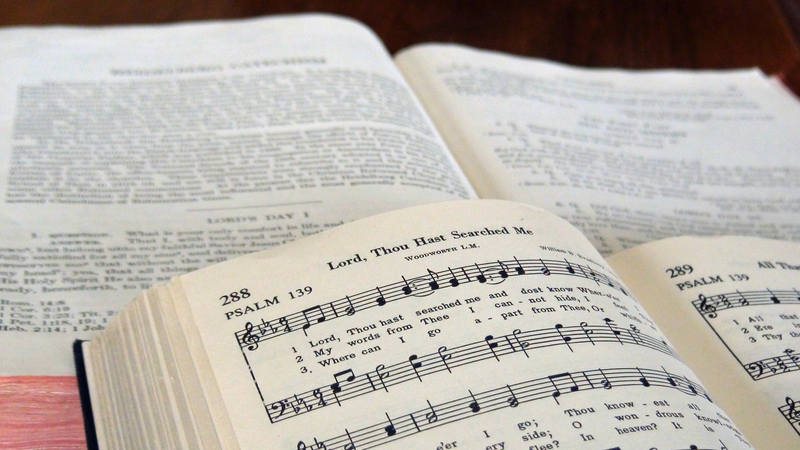 Has church music in total become nothing more than a quaint set of styles and traditions? So, in that respect, this shape-note singing experience served to me as a sober reminder that God delights not in hollow worship but rather in broken hearts (Psalm 51:17). On the other hand, however, it also struck me that these words—even if sung by unbelieving hearts—continue to attest to the glory of God. And as we sang, “‘Tis by Thy strength the mountains stand, God of eternal power,” I found myself rejoicing, for the day is approaching when all flesh shall come to the One who alone hears prayer (Psalm 65:2).